This complex combination of orange juice, cumin, black beans, and green chilies will have you and your family scraping the bottom of the pan, wishing for more. Luckily, you can make this recipe again and again! 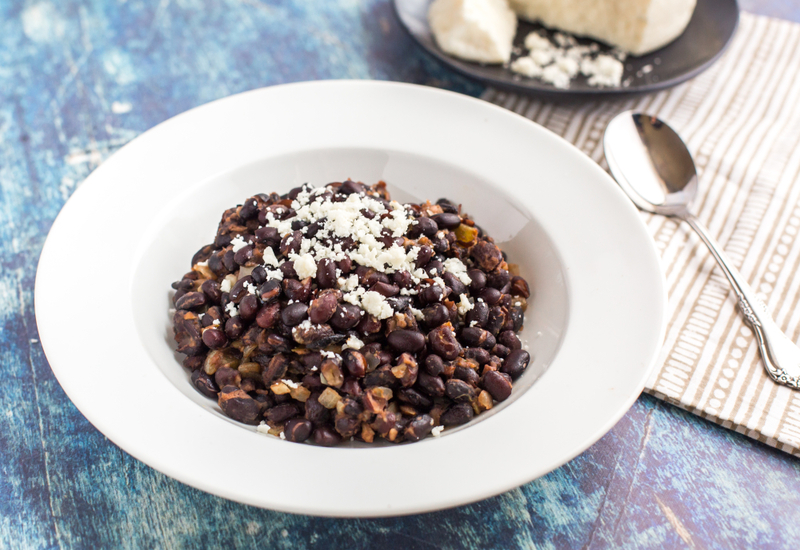 Black beans are filled with fiber and a great source of protein for vegetarians, and this makes a perfect side dish for taco night served with rice or topped with a fried egg and avocado for a simple lunch. Use any leftover beans as a savory base for chili, or reheated an spread on tortillas. Top with cotija cheese and a squeeze of orange or lime for a zesty finish! Vegetarian? Use vegetable broth in place of the chicken broth. Want more heat? Chop up some fresh jalapeño pepper and add to the pot with the onions and garlic mixture. Cotija cheese is widely available in grocery stores, but if you can't find it try queso fresco or some crumbled feta. Per Serving: 125 calories; 7g fat; 12.9g carbohydrates; 3g protein; 1mg cholesterol; 99mg sodium. This was a delicious chili dish. I think the chicken broth gave it great flavor, in addition to the garlic, onion, and cumin. You can definitely taste the citrus infused flavors, but it paired nicely together with the spice from the chilies. Black beans are on regular rotation at my house. This version with orange and green chili is really good. Lots of flavor!